I went in search of the last delicate pink Cherry Blossoms of 2014 in the Historic District of Hot Springs, Arkansas. Recent storms battered the pink blooms and buds before they were all completely open. What I discovered instead was a lovely dance of life. The city is nestled in the middle of Hot Springs National Park so the urban Wildlife often migrates between Tree lined streets and Forest trails. Beautiful House Sparrows have nests in many of the historic building near the double row of the glorious Japanese Cherry Trees. Searching the storm ravaged Trees for the last of their spring blossoms I discovered a female Sparrow among the sparse pink. As I was taking her photograph she bowed slightly and a male landed on her back. The balance did not hold and he flew to another branch. Seconds later he again landed on her back and they performed a successful “cloacal kiss” (How Birds Mate). I witnessed at least 5 successful attempts before he flew off to his own branch higher within the Tree. Their mating was a beautiful acrobatic coupling (see youtube posting below that includes both stills and video). Witnessing the creation of life is always a wonderful way to begin spring. I was heading to a favorite hiking trail when a fight broke out on the street. The combatants where clawing at each other in a fierce battle. I was really surprised and it took me a moment to raise my camera to document the conflict. Who knew Male House Sparrows could be extreme combatants. Based on the grip of one of the fighters I can see where the term “flipping the bird” comes into play. In April 2011 a Tornado ripped across Lake Ouachita State Park in Arkansas. It uprooted Trees all along the Caddo Bend Trail which is a 4 mile loop on a peninsula that reaches out into the lake. 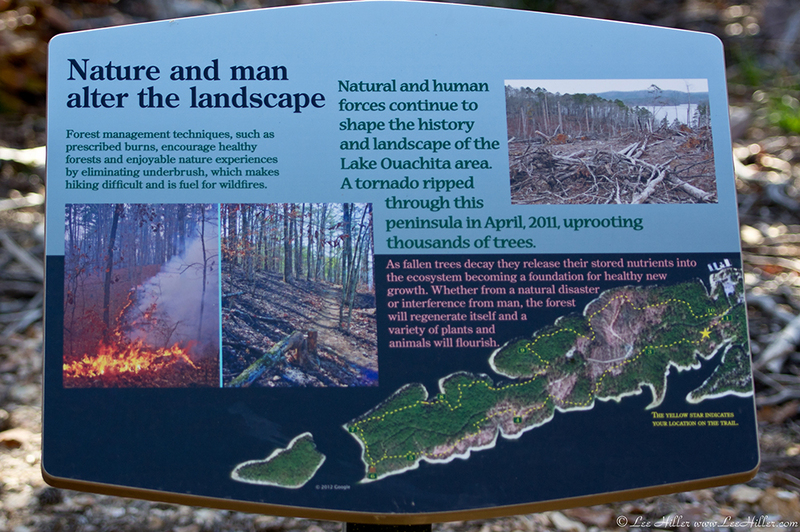 As you can see in the photograph above it razed several sections of the Forest on both the north and south side of the trail. I had not hiked the trail since the winter of 2011 (Lake Ouachita State Park – Caddo Bend Trail Pt 1 & Pt 2) and now I found myself in what felt like an alien landscape. It is dramatic to step from dense Forest into places devoid of Trees. One moment cradled in leafy beauty then suddenly out in the bright sunlight surrounded by fallen and snapped off Trees.